Star Trek featured many futuristic ideas: warp drives, transporters, and travel to strange new worlds, all of which have been discussed in great detail by experts and nerds alike. But what about the math of Star Trek? After all, there’s no such thing as Math Fiction...In fact, Star Trek featured many interesting mathematical ideas, including a paradox that upset both 20th century mathematicians and 23rd century androids; the mathematics of alien biology; and the most important question of all — when on a dangerous away mission, does the color of your shirt really affect your chances of survival? 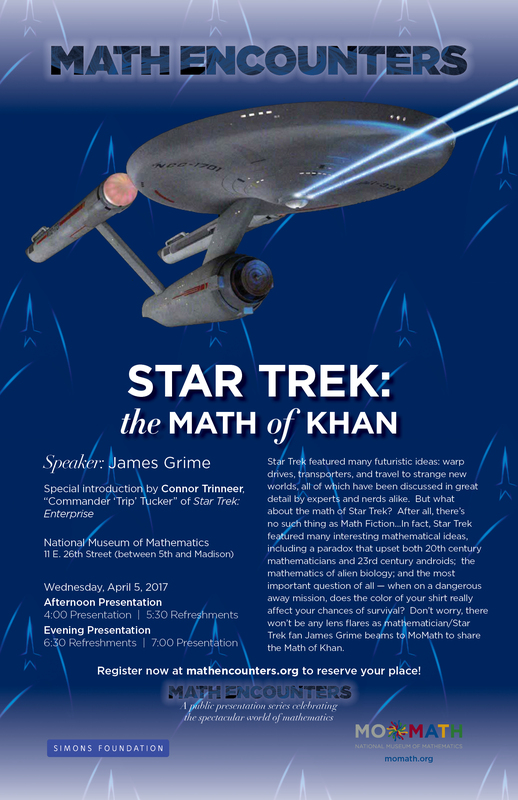 Don’t worry, there won’t be any lens flares as mathematician/Star Trek fan James Grime beams to MoMath to share the Math of Khan. Special introduction by Connor Trinneer, "Commander 'Trip' Tucker” of Star Trek: Enterprise.